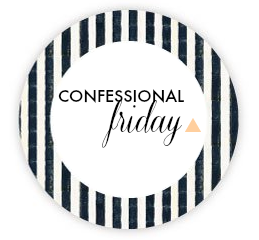 Today I am linking up with Leslie at A Blonde Ambition for her Confessional Friday series. Leslie is just so cute and I was so excited to see that she is expecting baby girl #2 this winter. Best wishes to you and your family, Leslie! Such an exciting time. This week, Leslie challenged us to show a typical day in our lives. I'd already been planning a post like this to document what these maternity leave days have been like (and trust me, no two are ever the same) so here's a glimpse into what this past Tuesday was like for us. Camille is starting to cry in her crib. This feeding time is really rare for us. Typically, she'll do a long first stretch and sleep from 9pm to about 5:30am, so this is sort of out of the blue. I roll out of bed and somehow land my feet into my slippers, shuffle into the nursery, and feed her with the lights down low. Camille is up again at her normal time for her "early breakfast." We do another nursing session in the rocking chair and then I change her diaper, lay her back in her crib, and swaddle her back in her Miracle Blanket. I'm getting back into bed around 6am. Fifteen minutes later, Ian's up for the day as he has some early cases. He's showered and out of the house by 6:45. After I tell him goodbye, I close my eyes again to try to get some sleep. Five minutes later, Drake barks at me to tell me he needs to go outside. I get him out and then am back in bed around 7am. Camille is up and ready to get the party started for the day. Our current Moms On Call schedule has her eating at 9am, so I'm trying to feel her out and look for hunger signs ... I'm thinking there is no way she will last until 9 and I don't want her to be hungry! Feed Camille and snuggle with her on the couch. We also do tummy time, which she's not too crazy about today. After tummy time, she goes in her swing (this was passed down to us from a friend, and it's her FAVORITE) which is right in the kitchen. I use this time to wash and sterilize my pump parts, get a cup of coffee from the Keurig, and have some watermelon and blueberries for breakfast. Camille is napping in her swing. Her morning nap (according to Moms On Call) should be 10-12, but since she ate earlier, she's asleep earlier. I'm just letting her call the shots at this point, and I'm okay with that. I use this nap time to pump milk for my return to work freezer stash, and then I shower. I skip washing my hair and opt for some dry shampoo ... gotta love those no-wash days. I used to skip shampoo days for the health of my hair, but now I just do it for the time savings. During this morning time I also tidy up around the house, write a blog post, run laundry, and spend some time with Drake. I grab an early lunch while I can. I have leftovers from the fridge -- chicken sausage, coleslaw, and a tomato and mozzarella salad. 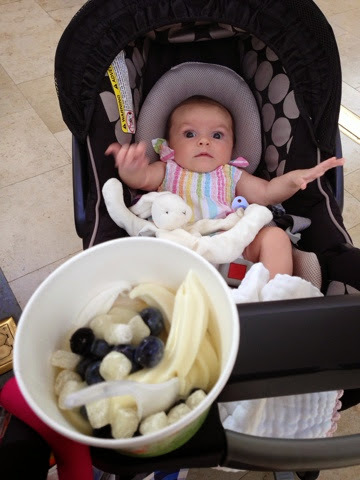 I read some favorite blogs on my iPad while eating, and watch Camille nap in her swing. This is a long nap for her and I'm attributing it to the fact that she was up at 1:30am. The baby is awake and it's time for her lunch. I get her fed, changed out of her pajamas, and then we take some fun photos together because she is just looking particularly scrumptious. Afterwards, we rock in the rocking chair and read a book. I love using my Boppy pillow for this time -- I have her sitting on my lap facing outwards and then I put the Boppy around her tummy and sides like a horseshoe. I prop the book on the Boppy so she is held up and can see the pictures (if she chooses to look at it versus the light on the ceiling, her favorite). I get the baby loaded up in the car and we head to the mall. I have been introduced to an awesome new class at the gym that we can take together on Mondays, Wednesdays, and Fridays, but since this is a Tuesday (and a hot one), it's time for some good ol' mall walking. I turn on my Map My Run app in the mall parking lot and make a goal to walk 2 miles before we leave. We return some items for Ian at Belk and drop off a top of Camille's at the monogramming kiosk. I pick up a few foam soaps on 50% off sale for us and my mom at Bath and Body Works and also purchase two new tees for myself. I've been looking for a perfect relaxed-fit shirt to throw on with shorts, and LOFT has them on sale for $8. They are awesome for my post-pregnancy tummy. I pick up one in grey and one in seafoam. (This is the shirt ... I'm going to get one or two more and I have my eye on dandelion and light lobster). Camille has her second lunch via bottle in the dressing room of LOFT. Afterwards, we pick up her monogrammed top and I have a little afternoon snack. We've walked 2.5 miles now around the mall, so we head to the grocery store where we buy dog food, milk, half and half, and two "custom meals" for dinner. We have implemented Takeout Tuesday in our home, which is a huge timesaver. Our grocery store has these custom meals for $6 in the deli, and you can choose one protein entree and two sides. It's the best deal. I got their poached salmon, kale salad, and apple salsa (apples, tomatoes, green onions, and cheese cubes in a vinaigrette). We are back home and Ian plays with Camille while I put away the groceries and get ready to feed her. Camille eats, gets burped, and then we snuggle. Later she swings a bit before falling asleep in her swing. I spend the next hour working on a calligraphy project ... wedding invitations, my favorite! We move Camille from the swing to the Rock and Play and take her out on the screened porch, where Ian and I eat dinner together at the picnic table. We don't watch television with dinner (as we normally do) which is really nice. We need to do this more often. Ian's feeding Drake his dinner and getting him outside. Camille's in the bathtub and, towards the end, is not a happy camper. I'm rushing through the last part of her bath so I can get her wrapped in her towel like a delicious little burrito. She gets a new diaper, has her late dinner, I put her pajamas on, and Ian and I watch her mesmerized by the mobile that my friend lent us. 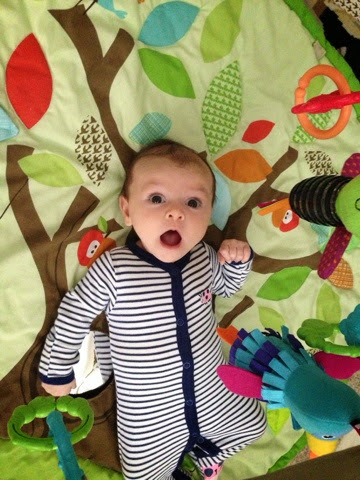 She loves the black and white patterns and is cooing with delight. It melts us. Lights are off in her room around 9:00. Ian and I are positively whooped. He's doing some computer work and I'm returning some emails and looking through Instagram. He discovers that after updating his software on his iPad, a bunch of his work documents are missing. We are both stressing out trying to figure out what happened. I am no help because I never update my software ... for this very reason. Thanks, Leslie, for giving us a platform to share our days and see how others spend their days. I can't wait to read the other link-ups! Just a suggestion: Don't worry too much about a freezer stash! When you return to work, you will be pumping every time she has a bottle. For example, I pump on Monday for Tuesday, Tuesday for Wednesday,...,Friday for Monday. I pumped at least once a day on maternity leave and ended up donating most of it! Whew!! Sounds like a busy day!! I am tired just reading it! Eating dinner without the TV is definitely something Matt & I need to do more often too! Busy day, but looks like you have everything under control! Camille is just so beautiful. I didn't realize you did calligraphy! It looks beautiful on those envelopes! GIRLFRIEND YOU ARE BUSY. I cannot believe you managed to stay up until 11pm with that day and no nap! I'm super super impressed. And I love your calligraphy. I love writing out addresses and have thought about practicing a little myself. Did you take a class? Camille is too precious! I also never update my software just for that same reason. Unfortunately, I'm now to the point where it is so outdated many of my Apps aren't working! Busy day, but definitely the typical life of a momma! I can't believe I'll be headed back to this life in just a few short months...but this time with a toddler to entertain! yikes! A busy day indeed, it truly seems like you have a good handle on it. My goodness that seems like a long day! Camille is just the cutest baby!!! I don't think I have ever seen a baby that is cuter or prettier than she is! Makes me wants one, but then I come back to reality. Adorable! you have the prettiest little girl! :) also... the prettiest calligraphy! ohh caligraphy, do you make things to sell? She just cuter and cuter. And those eyelashes! Are you doing baby power hour at the Y? I loooooved going when Maggie was that age! Such a good class and I love that baby gets to stay with Mama!! I am obsessed with those sunwashed tees from Loft! They are so incredibly comfy. Love your blog....Camille is gorgeous! Man do you get a ton done in just one day! I can't believe how big Camille is getting. She is just so pretty!!! Whew! Busy day mama! And she was looking particularly scrumptious :) cute pics! Wow, how on earth do you stay up til 11 pm?? I can barely make it to 10 on a good day! By the way, I totally identified with your post a few weeks ago on bath time, as that tends to be a stressful, baby screaming, mama almost in tears herself time of day for us! I read a few days ago several moms saying that they learned their babies like the water temp hotter than one would think was appropriate for little babes. I've done it the past three days (followed by placing her in her hooded towel on top of an adult towel on the bouncy seat) and bath time has been a totally different experience for us! Lawter's been so calm, and a few times, actually smiley! Of course there's no guarantee it's the water temp change that's caused it, but so far so good! Hopefully she had another nap! For her to be up from noon until 9 pm is crazy!! Read Dr. Weissbluth book about healthy sleep for babies..he was the head of Children's Practice at Northwestern. Many celebrities go to him for advice! You are so strong - I don't know how you do it. It seems smart to me to have a backup stash - do you typically pump after she is "done" or do you try to keep her feeding a bit longer and then pump at other times. Biology, amazing stuff I look forward to experiencing myself someday! Is the $6 thing at Teeter? Might be worth sharing with my widowed Aunt in CLT. Wow! 11pm?! I could have never done it. Brad always took the late feeding around that time. I had been in bed for a hour or more by then. We started the 7pm bath and bed by 7:30pm when she was a month old. She still does that waking up at 7:15am. That works great with our work schedule. mama, i am impressed that you lasted until 11:00! most nights we are in bed after we put carter to sleep at 8:30ish. haha!